Artist Andrea Maack has launched a trio of unisex perfumes, Smart, Craft and Sharp. 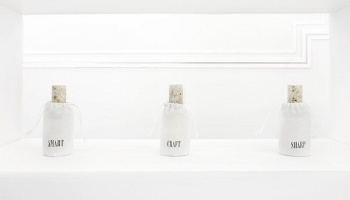 The perfumes, which Maack has been using as part of her conceptual art installations for the past two years, were developed in collaboration with French perfumery APF. Smart features violet leaf, jasmine, sandalwood, vanilla, white musk and buskin buckskin. 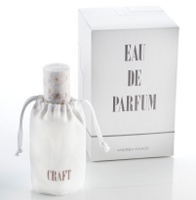 Craft has notes of aldehydes, elemi, cold metal, ice, cedar and patchouli. Sharp includes orange blossom, angel skin, sweet vanilla, white musk and soothing softness. Andrea Maack Smart, Craft and Sharp are available in 50 ml Eau de Parfum, and can be found how at Spark Design Space in Iceland, 65€ each. A buskin is a kind of half boot – worn during Roman and medieval times … so “Smart” contains notes of very old footgear. I am accepting of this because it’s Friday. You are bigger than I, Dzingnut……even though it’s Friday, I still CAN’T accept “notes of very old footwear”. Got a correction…that should be buckskin. Angel skin? Ouch. Apparently Sharp is very sharp. And soothing softness? Is that like dryer sheet accord? And ice? Okay. I’ll stop now. The Anti-Cruelty Against Angels society should be chiming in about now….”stop skinning angels against their will” (of course if it was WITH their will, then that would be equally disturbing) ….watch out for spray paint toting activists….of course they all had to register their spray paint purchases….. maybe I should just go weed some flower beds…. Herbe Mauvais! I LOVE it! Demeter makes Dandelion – it’s one of my favorites of theirs. Well, if they are interested in introducing Crabgrass, Dollar Weed, or Bermudagrass–I will be happy to sell them the raw material at very reasonable prices! I laughed. Hard. Still one of my favorite comments and always comes to mind related to CdR. well, it does sound sort of creepy….plus I’m trying to understand how anyone could get ‘baby skin’ out of CdR? In any case…baby skin is for babies and I wouldn’t want to smell like baby skin. Baby skin is one of the most gorgeous smells in the world – sweet, milky, powdery, slightly musky. I don’t find that creepy at all, but I don’t read anything into it other than the simple fact that babies smell good.. I didn’t know angels had skin–I thought they were spirits and had no physical bodies. In any case, Sharp does not sound very sharp. Smart actually sounds rather nice. I am taking buckskin to be deer hide, i.e., a leather note. Craft sounds rather scary–ice? Cold metal? For people who like to go rock climbing in January, perhaps? There have been some cool metallic fragrances over the past few years…although at the moment my mind is blank. Will think of some later! I’m actually totally into the idea of cold metal and ice (and aldehydes! ), but will most likely never try this. Yeah, I was thinking, Ooh, aldehydes and cold metal sound really good in this terrible heat. I just can’t quite square that with cedar and patchouli… it seems schizophrenic. I’m still shaking my head over “angel skin.” Who in the world in their marketing department thought that this would be an appealing note??? Ouch indeed!